The long and highly successful engineering collaboration between Ricardo and Cooper Corporation of India has been highlighted with the launch of the first of a completely new range of Cooper engines at the prestigious Delhi Auto Expo. The 2 cylinder vertical in-line engine family unveiled at the Delhi show is available in diesel, CNG and LPG versions ranging from 26 to 55 HP and is intended for both domestic Indian and export markets. 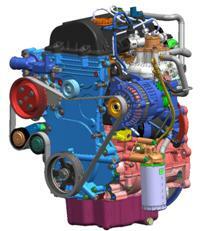 Part of a complete range which will ultimately include in-line 4 and 6 cylinder variants of up to 280 HP, the new Cooper engines are intended to provide robust, durable, high fuel economy and low maintenance power for applications including automotive products as well as generator sets, pumps, construction equipment and industrial and off-highway vehicles. Moreover they are future-proofed in terms of meeting both the current automotive Bharat IV emissions regulations (Euro IV equivalent) as well as being capable of upgrade to meet even tougher future norms. 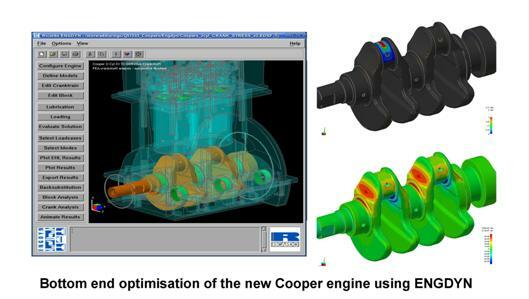 The new engine is the result of a very close collaboration between Cooper and Ricardo engineers, using the very latest in design processes and computer aided engineering (CAE) technology to deliver a truly world-class design. The new product incorporates the latest 1400bar common rail direct injection technology for its diesel variant or multipoint gas injection for CNG and LPG applications, using centrally mounted injectors for optimum combustion. Performance and emissions were optimised using Ricardo’s market-leading WAVE engine performance and gas dynamics simulation software. The cylinder head incorporates double camshafts with roller finger followers for low friction, actuating four valves in each cylinder for excellent engine breathing. Extensive use of finite element analysis was made using both the Ricardo FEARCE product as well as other industry standard software, to produce a durable, thermally and mechanically efficient cylinder head design. The robust nature of the engine and its superior NVH signature are assisted by the use of a structural bed plate configuration, with the crankshaft and crankcase subjected to stress and fatigue analysis using the Ricardo ENGDYN coupled crankshaft and cylinder block analysis product. Low cost of ownership was of paramount importance to the design team, and the new engine boasts excellent longevity and ease of service. This longevity is evidenced by an impressive B10 life of 7000 hours (the service life for a statistical expectation of 10 per cent attrition) or 250,000 km in a vehicle application. With a highly competitive regular oil change interval of 500 hours, all service points are provided on one side of the engine and hydraulic lash adjusters help to avoid the need for periodic tappet adjustment. The new engine is also designed for straightforward long term maintenance, for example with the inclusion of wet cylinder liners for simple replacement.